A recent Gallup poll says some 37% of US adults do not feel safe walking alone near their home at night. Despite a narrowing over the years, the poll suggests a gender gap in security still exists. Nearly half of all women, 45% say they do not feel safe, compared with 27% of men. Thankfully, there is an increasing number of wearables and gadgets that make it easy to call for help. Although panic buttons have been around for a while, its only recently though that they have become smaller, wearable and discreet. Ripple is another personal safety device that wants to be there for you during emergencies. Through the service, users in the US have 24/7 access to Tunstall, one of the leading global companies for user monitoring and emergency support. The little padlock looking device has a brooch-clip design which makes it easy to attach to clothing, keys or jewelry. 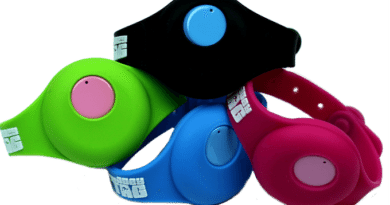 Click the wearable or the app, and the user will immediately receive a call from the professional Tunstall monitoring team to his or her smartphone. Click once if you feel you are in an uncomfortable situation. This is used for anytime you just want someone there for you. If you feel you are in a serious emergency but can’t talk on the phone, click three times and the monitoring team will send first responders directly to your location. They will also relay all of your critical information to them on your behalf. When setting up your personal profile for the first time, you choose information you wish to share. This includes your picture, date of birth, physical description, allergies, medical conditions, current medications, and anything else you feel may be important. This means, the support Team knows all your vital information ahead of time, saving you invaluable time during an emergency situation. “Even in today’s connected world, there are moments when we feel alone and unsafe. Help can seem a little too far away, or we may be too embarrassed to ask for it,” said Founder and COO Rees ‘Bo’ Gillespie. The penny-sized Bluetooth device is water resistant and never needs charging. The battery lasts six months, and when it expires, you will receive a new one for free. The company behind Ripple has turned to Kickstarter to raise funds for its development. They are off to a good start. Just a few days in, they’ve raised nearly a half of the intended $50,000 goal. The device is scheduled to ship April 2017.